James Rowe interviewed Martijn Reuser who is currently manager of the under 15’s Dutch national team. They spoke about his new role, playing for Ajax under Louis van Gaal, and his time at Ipswich Town. 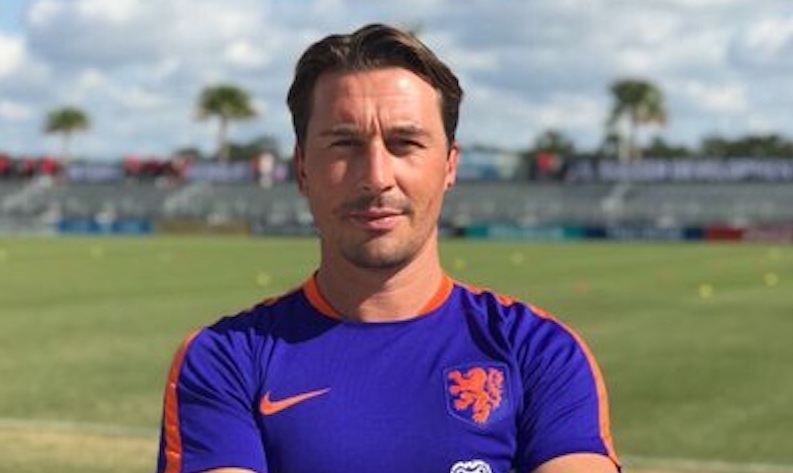 You are now manager of the Netherlands under 15’s national team. How did you work your way up to becoming a national team manager and are you enjoying the role? After my playing career ended nine years ago I have slowly entered into management. I started training my son and then amateur clubs, and after than I went on to manage different youth teams at NAC Breda and ADO Den Haag . The last four years I have been assistant manager of the Dutch national team under 15’s and I also spent two years as assistant of the under 16’s too. I have learned many things and I have taken many things on board. A position opened up to manage the Dutch national team under 15’s and after feeling that I was a good enough manager, along with positive talks with the KNVB, we decided that I would take the job. It’s a prestigious and honorary job and I am really happy to be the manager of Dutch national team under 15’s. What is for you the challenge of becoming Dutch national team manager of under 15’s? I really enjoy working with the youth players and improving them and making the training sessions fun. I also enjoy helping them achieve their dream of becoming a professional footballer. If you look at the current state of Dutch football in an international sense, we have missed two major tournaments. I hope that I can contribute in the future to ensuring that we provide players so that the Dutch national team can once again be present at World Cups and European Championships. You touched upon the Dutch national team missing two consecutive major tournaments. Do you have an opinion as to why the Netherlands have been unable to qualify? Yes, my opinion is that in the past here in the Netherlands we have been inventive and progressive. We also had very good ideas too, but other countries have not stood still in recent years. If you look at the professionalism of smaller countries and the openness we showed here in the Netherlands, allowing countries to come and look at how we do things, these countries have improved but we have stood still in regards to certain developments. In some aspects we have missed the boat. I believe that our tempo within matches is lower than other national teams and must increase. That is what we are trying to do. The way in which we train is also important in terms of intensity. I believe that we have enough talent here, it’s just that in some aspects we missed the turning and hopefully we can turn the tide to improve once again in future. During your playing career did you always have the ambition to become a manager one day? Absolutely not. When I was a player I thought that being a manager would not be the nicest thing to do . I also admit that I was also not the easier player to deal with in the past, having disagreements with managers due to me being stubborn at times. I also worked with very good managers during my career, such as Louis van Gaal, and after my career I was evaluating what to do next in my life. I started to train the team my son plays for, and I have come to really enjoy the profession. It’s a great profession where you can help people realise their dreams to become a professional. I enjoy guiding people. I once had thoughts of never becoming a manger, but these have now turned into really enjoying being a manager, and the moments of learning as a player in my career are now learning as a manager in my own right. You mentioned Louis van Gaal, and as someone who played under him at Ajax, what would you say are his skills and qualities? He is very demanding and he demands 100 percent from his players every day, in terms of intensity and quality. He is tactically very strong, and also prepares his teams very well. He is also fanatic about football and an extremely skilled person in regards to football management. He is in all aspects an enthusiastic and accomplished manager. You played 4 seasons for Ipswich Town between 2000 and 2004, and in the Premier League. How do you look back on your time at the club? I always had the ambition to play football abroad and it was a fantastic experience to play my football in England. When I arrived at Ipswich they were playing in the first division, and they took me on loan in order to make the last step to the Premier League, which happened via the play-offs. Ipswich then brought me outright. We were very decisive, and in our first season in the Premier League we finished fifth but the following year we were relegated. I became a kind of ‘cult hero’ in Ipswich because I was an important part of their promotion to the Premier League thanks to my goal against Barnsley in the playoff. If you play well for an English club they really appreciate you as a player. I still look out for their results in the Championship. When you look back on your time in the Premier League who were the opponents that stood out for you? I played against many good players in my career, but if I was to mention players that really made an impression on me then that would be Ryan Giggs and David Beckham, but also the Arsenal team that they had back then with Dennis Bergkamp, Frederik Ljungburg, and Patrick Vieira. I remember that team from Arsenal were really physically imposing, but they could also play great football. I also always admired David Beckham’s stamina and kicking methods. I remember playing against Manchester United at home at Portman Road and my Dutch teammate Fabian Wilnis and I looked at each other and said to ourselves “are you going to take on Ryan Giggs today or will I?” because he was always such a handful. Giggs was so quick and nimble with the ball. Finally, Martijn, we have already mentioned Louis van Gaal, but are there other managers you played under that were important or influential in your development? Yes, for example Gerard van der Lem, who was Louis van Gaal’s assistant at Ajax. Back then I was a really young, streetwise player who would often just want to have fun, and Louis van Gaal was demanding. Van der Lem would often put in a good word for him to Louis van Gaal if I was playing jokes from time to time. Henk Ten Cate gave me the chance to show my worth at Vitesse Arnhem, and was important in bringing me to the club. Frank Rijkaard gave me my debut in the Dutch national team in 1998. It was a friendly match against Ghana in the GeldreDome in Arnhem. It was a 0-0 draw. It was not the most special match to watch but the fact that I could make my debut in the Dutch national team meant a lot to me. It is a shame I did not get more caps, but I believe that there are only 750 players who can say that they played for the Dutch national team of which I am one. But now I am Dutch national team under 15 manager, which is fantastic.